This White Powder Gold was made using a variation of the John Hudson method with Calcium Montmorillonite clay, Organic Dolomite Lime, and reconstituted Dead Sea Salt Water. Calcium Montmorillonite clay has been used by Native American healers for centuries as an internal and external healing agent. Also known as "living clay" for it principally consists of minerals that enhance the production of enzymes in all living organisms. The Natives would use this mineral rich clay on open wounds and for stomach or intestinal distress. The use of Calcium montmorillonite clay for the health care of humans and animals have been an accepted practice throughout the world for many years. 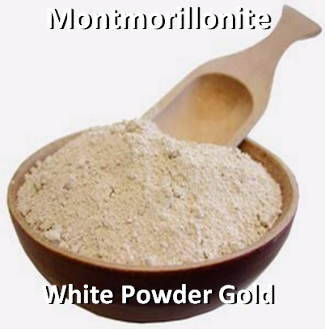 Montmorillonite was first described in 1847 in Montmorillon, France more than 50 years before the discovery of Bentonite in the US and is named after that city. In years past sailing vessels departing from France were known to store clay on board for the treatment of dysentery as well as other ailments. Animals, domestic and wild alike, are instinctually drawn to clay deposits have been observed licking the clay as part of their everyday diet, and rolling in it to obtain relief from injuries. Hebbard mine discovered in 1946 in Southern California and the source for premium clay. 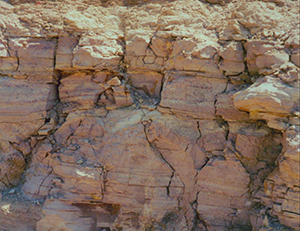 The lower layers of the mineral deposits are an extremely fine particulate size and compacted into rock form. This deeper strata is protected from modern, man-made, harmful pollutants, rainwater leeching and other windblown contaminates. It is this deeper layer that is the source of premium clay products. This impressive assortment of minerals includes calcium, iron, magnesium, potassium, manganese, and silica as well as trace elements, those appearing in very tiny amounts. The mineral content being extremely high sets the stage for replenishing dietary deficiencies. Today more than ever before, diets are lacking essential trace minerals and micronutrients. Without the basic minerals, life cannot exist; without trace minerals, major deficiencies may develop. Lack of either will make it impossible for the body to maintain good health and function properly. In clay the minerals occur in natural proportion to one another encouraging their absorption in the intestinal tract. Natural “Calcium Montmorillonite clay restores minerals in the tissues where they are needed. Furthermore, minerals are the carriers of the electrical potential in the cells which enable the hormones, vitamins, and enzymes to function properly. As mentioned above “Living Clay is known to have been used historically as an effective antibacterial in the treatment of dysentery, and as a means of decontaminating water. Presently it is being used internationally to clarify and balance small and large bodies of water. This is so because “Living Clay particles are smaller than many bacteria; when bacteria encounters an environment abundant in clay it becomes surrounded by the clay, and imbedded in it. The immediate result is that the bacteria are unable to receive nourishment and cannot survive. Because of its inherent healing properties, clay has long been recognized as a subject worthy of study. It is included as such, in many educational institutions today, which teach pharmacology, herbology, and nutrition. “Calcium Montmorillonite Clay is currently being utilized in hospitals outside of the United States where it has already proven its effectiveness. In recent years clay has become a topic of discussion in numerous publications. Recently more information has become available outlining the important role “Calcium Montmorillonite Clay can play in the recovery and maintenance of health. It has also been receiving significant recognition by the health care community, as a proven and much overlooked natural alternative remedy in the prevention and cure of disease. Recent exposure has spurred the interest of people around the world, prompting them to seek out reliable high quality resources for clay. This well deserved notoriety is serving to educate the public about this natural healing agent, as a true “Miracle of Life."